After visiting family in South Africa, we traveled to Utrecht, and then Amsterdam. We climbed the steep, narrow and practically vertical wooden stairs to the tiny Airbnb apartment we will stay for the next three nights, quickly unpacked, got plugged into the internet, caught up with a few things then headed off to meet Bo Bakker in what Google Maps estimated to be a 32 minute commute. Well, of course we got a bit lost, took a few wrong turns but eventually got there. Again three steep (but not so narrow) flights of stairs to reach his apartment. No wonder the Dutch are all so slim! Bo’s studio and home are very spartan, almost monk-like and dedicated to his work of portrait painting. Light comes in from both sides of the main room where he works on his paintings and also photographs his models. Steep narrow wooden stairs lead up to his bedroom, his darkroom, an annex and a small kitchen leads off the back. Bo grew up on his parent’s 400 ton Dutch canal boat for the first seven years of his life and loved it. Eventually it was time to head off to school and he moved in with his grandparents. Even as a child on the canal boat coming back from the dark countryside to the bright lights of the city he knew he would live in the city when he was older. He’s lived here on the third floor for the last 25 years, very central to the core of Amsterdam. Like many city-dwellers he doesn’t own a car but travels when needed by rental car or taxi, by far the best way to drive a car in these small crowded cities with absolutely zero parking space! He even drove a taxi for a year and thoroughly enjoyed it but decided his body didn’t enjoy it plus it took time away from his true passion of painting. When he craves more comfort he spends time at his girlfriend’s place, a close 4 km away but mostly he’s here working on his classical oil portrait commissions. He was just cooking a big pot of chicken stock when we finally arrived and asked us to offer an opinion on whether there was too much lemongrass in it. No, it seemed perfect! Although he’s not a big cook, he tries to eat as healthy and organic as possible for his health. A few years ago he was like the Hunchback of Notre Dame, stiffened up and hunched over from some unfortunate medical condition possibly due to the stress of having to finish an important painting for a competitive exhibition with his contemporaries, this dancer jumping in her green dress. Happily, his health returned but he’s careful not to let it slide. He shared a revelation he came across about 15 years ago when reading a book by David Hockney who spent two years studying his studio walls plastered with images of realistic art from the masters. Hockney determined that there were two schools of realistic painting in the 16th century, optics (with the aid of lenses, camera lucida, camera obscure and curved mirrors) versus drawing, direct observation of nature. Vermeer and Frans Hals, for example, used optics of some type to project the image onto the canvas to be drawn which is the only way to capture those light natural smiles and compositions. Even though his work was photograph-based, Bo had always painted in a realistic manner scaled up in the grid manner. Now he projects his drawings and captures the lines in charcoal on his virgin white linen canvas. “Painting a portrait is hard enough work, I don’t need to make the drawing part hard as well.” Each face takes about three or four days hard work to capture. He works in a wet on wet technique in oils and finishes each face separately because wet on wet technique needs to be completed in one session even if it lasts a few days. This commissioned portrait will be displayed at the subjects’ wedding party exactly like this in five days time. It would have been finished in time but work was delayed due to a bruised thorax. 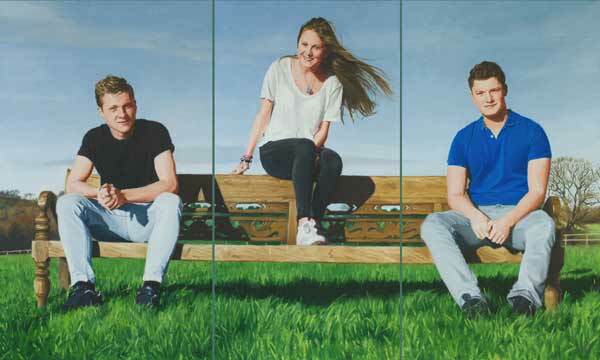 This is the second portrait for the same family who commissioned life-size portraits of their two sons previously, obviously dedicated collectors of Bo’s work. Not usually a highly social partygoer, Bo will be a guest at this wedding, missing his own younger sister’s wedding on the exact same day, something he’s not sharing with his elderly parents who would not approve of the gay marriage. 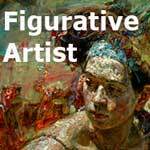 Bo commented that there were not many “portrait artists” on our figurative art site. It’s true that while we have nearly 1000 artists, not so many have classified themselves as “portrait artists”. 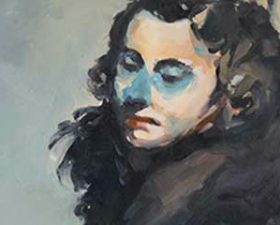 As the site first began as an invitational site and has now evolved into a submitting site, this is partially by accident and I DO have a fabulous list of portrait artists that I eventually hope to contact and invite to join. On our recent visit to Cape Town, South Africa we noticed a real movement towards the Big Face on the Big Canvas but these cannot be classified as real portraits, just juicy oversized figurative art. There’s certainly a swing towards figurative art these days though, which should be good news for us. 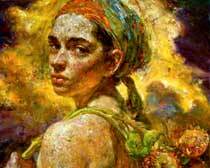 Bo lamented the flood of artists coming online who take a few courses and then call themselves “portrait artists”. It’s becoming hard to keep visible online as a portrait artist who lives solely on his portrait painting commissions. On his own site he has worked hard on SEO, search engine optimization, as he knows this is what keeps his head above water. His next website task will be to make his site web responsive for mobile devices. Very computer savvy, he admitted a fascination for Google Earth and the delights of armchair travel to distant lands in the comfort of his own living room. He particularly enjoys driving around English countryside, old neighborhoods in Italy and Japan, all through Google Earth. One investigation leads on to another as his interests are varied, including geography, geology and history and with the world’s largest library at his fingertips on his keyboard he sometimes finds it a delightful/dangerous waste of time. Along with some negative things, the Internet opens up a huge world of wonderful possibilities that we’ve never been able to see before. Unless he has to travel to a different country, his models come here to his studio to be photographed. With his well-designed natural light setup it’s always perfect light inside his studio no matter what the weather is outside. He uses the most modern broad-spectrum high-frequency daylight lamps to create no tremble or shimmer and deliver perfect light at all times. He paints with the curtains closed at one end so there are no reflections on his canvas and it’s always lit with the same light all the time. As a child, he played the oboe. His teacher insisted he practice in a closet filled with clothes for the perfect sound and that way he would hear every failure. This harsh light is the same, it exposes every failure and and allows him to correct them before they’re made. He has a lot to thank his girlfriend for as she got him started on portraits about 15 years ago. As Bo is colorblind (Brett Williams, my previous studio vista was also colorblind) she helps with the colors sometimes. When the labels become unreadable on paint tubes he can’t use them until she tests out the colors, determines what they actually are and relabels the tubes. For example in the wedding portrait he said he was not too sure about the black shirt the young man in the bottom was wearing and she pointed out that his shirt was actually red but he had not known it. It was only in his second year of art school that he was tested and discovered to be colorblind. When his next piece was reviewed in an exam, it was remarked on for its beautiful colors. When the teachers explained to the adjudicators with the artist had only just discovered he was colorblind, they could not believe it! Wet Canvas did a blog about him with an interest in his process and a fondness for his color use although he insists he is not a colorist. For skintones he uses burnt sienna with some Van Dyke brown. He’s developed his own system for colors but she has the final word for any color mistakes. He uses mainly Rembrandt Talens oil paints with no additives, only a bit of retouch varnish and linseed oil and no solvents. He does not “finish varnish” his paintings but rather tells his customers to take them in one year to a framer to finish varnish as he does not see this aspect as his job, others have more expertise plus it takes at least 6 months for the right moment to varnish and the works have long since left his studio. When his models arrive, they come in clothes of their own choice which will be painted for eternity and he urges them to choose carefully. He works with them as the pose develops and shoots about 600 photographs, eventually possibly doing some Photoshop compositing to arrive at the perfect composition. His aim is for a naturalistic true rendering of the character and history seen on the face of his subjects and when they ask for a little less eye droop here or a little more flattering bit there, he works with them to find a good compromise but insists any straying from the accurate will be at their risk and not his. Without photography it would be impossible to capture the loose relaxed spontaneous poses he aims for. His background in illustration and technical drawing helped with the expansion of this bench above and he’s glad he has that knowledge to draw upon. When he began figurative painting about 15 years ago, he had a big camera with a big telescopic lens carried in a shoulder bag/holster with an open bottom. He would stand on one sidewalk and when he saw a character or attitude he wanted on the sidewalk opposite, he’d quickly swing the holster up, exposing the open lens below and snap his target unawares from across the street. To be able to blow up a photograph big enough to have the information to work from on a large canvas takes a powerful lens at that distance. These paintings of young women in shorts were his first figurative works. He showed them to the Morren Gallery in Utrecht. 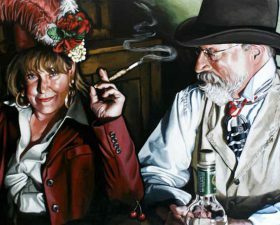 They took him on as a featured portrait artist in their dedicated portrait gallery, Portret Winkel. 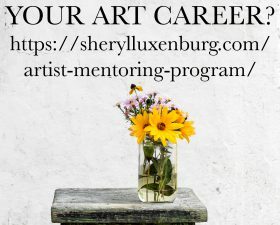 One positive aspect of only creating commissioned artwork is that he will not be left with a house filled with his own artwork that could not be sold, a burden on many artist’s families. He throws away a lot and never paints over old work as he needs a virgin white canvas for his smooth thin surface treatment. He stretches his own linen canvas on his big smoothly painted Masonite floor which serves as his big worktable. 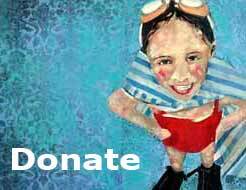 His main galleries are the Morren Gallery in Netherlands and London Fine Art Commissions plus commissions through his own website. Thanks Bo, it was a pleasure to meet with you and enjoy the wedding party!